I'm going with the benefit of the doubt that Ted Leonsis is a sane person and not crazy. I say this because I have difficulty trying to understand the actions of an owner that refuses to make a move that would benefit the team as I watch countless other teams do. 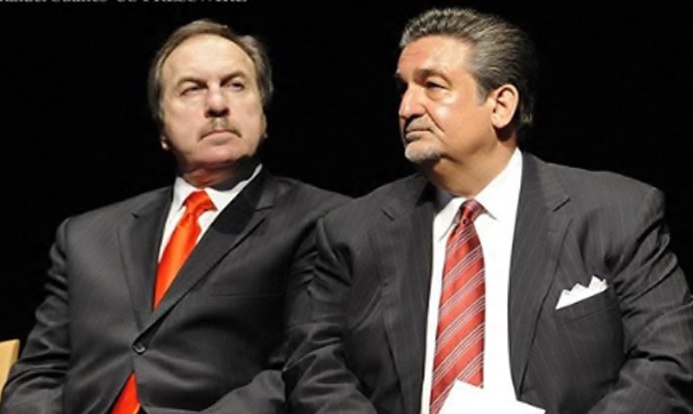 Leonsis is keeping Ernie Grunfeld as Team President and GM despite the fact for 13 years he is doing a terrible job of fielding a team by signing players who aren't good or are too hurt to play, losing season ticket holders, and seeing embarrassing low arena attendance each game. As all this is taking place Leonsis defends his actions by setting a low bar, blaming it on the building he owns, being condescending towards fans, and even fighting fans. This completely makes no sense as at one time Leonsis was pretty connected and well liked by fans. Why he would become so condescending and combative with fans unless he was protecting someone. Protecting his friend. And that is completely understandable and makes absolute sense. I know I'm going real arm chair psychologist right now but bear with me. I mean it's all there when you really look at it. The constant sly remarks towards his own paying customers, the words he had with a fan last week, the building excuses, and the low playoff bar. He's protecting him. He's protecting his friend. I mean who hasn't done this for a friend or family member? I've protected a friend before. I've got into physical altercations protecting a brother. I've made excuses for friends knowing damn well I shouldn't have. I've set a low bar a couple times for kids just so they can get out of a punishment and play. I've done what Leonsis has done and you probably have too. Think about it. A fan in the stands that has every right to be disgruntled made a sign showing his displeasure about Grunfeld. 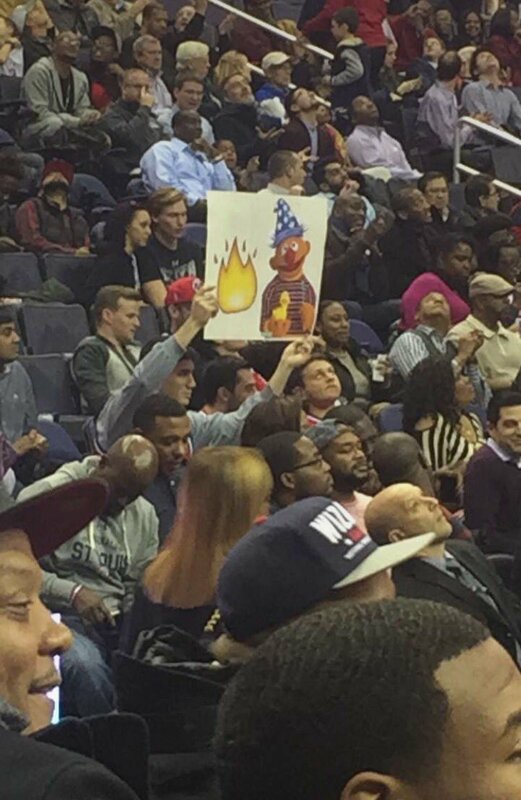 Yes he wanted to make sure Leonsis saw it as this fan is confused just as many others why he is still the GM of this team. Leonsis, protecting his friend, insults him and then later gives him a cookie for the attention he received. This is basically "Hey don't talk about my friend" attitude. I understand Ted Leonsis for the first time since he's owned this team. Ted Leonsis needs to understand his friendship with Ernie Grunfeld is stopping the Washington Wizards from progressing. We've actually seen this in another sport. For years Dan Snyder was hated because of his relationship with Vinny Cerrato. The Washington Redskins were the laughingstock of the NFL because Cerrato made terrible decisions for years. Finally he let go of his friend and power. Snyder hired Marty Schottenheimer as head coach with executive and personnel power back in 2000. Snyder fired Cerrato, started off slow, and finished with an 8-8 season. Things were looking bright for next season until Snyder fired him and re-hired Cerrato. The Redskins became a laughingstock once again for years until he finally let go of his friendship (again) and hired Coach (with exec. and personnel power) Mike Shanahan, Bruce Allen (for a time GM), Scot McCloughan, and later on Jay Gruden replacing Shanahan as head coach. This resulted in two NFC East titles, playoff appearances, recently first time back to back winning seasons, and more. These are accolades I haven't seen in my lifetime. An even better example is up I-95. In 2012 the Baltimore Ravens were struggling on offense bad when potentially this should not be an issue. Head Coach John Harbaugh fired his Offensive Coordinator Cam Cameron. These guys were real good friends. To quote Cam Cameron "great friends". Harbaugh had a decision to make after losing to a now respectable (and later on NFC East champion because of a decision Snyder made years ago stated earlier) Washington Redskins team. He could either ride with his great friend Cam Cameron or understand that he has a responsibility as head coach to a team and it's fan base to do what is right for the Ravens organization. Harbaugh fired Cameron. Eight weeks later the Baltimore Ravens won the Super Bowl. Ted Leonsis needs to take a note from Snyder and Harbaugh. If this is about friendship he needs to understand he has a responsibility to the players on the floor, season ticket holders, and fans all over. This low bar you set for your friend is always playoffs like that is the end all be all. Leonsis tweets or blogs during or at the end of a struggling season basically saying "You see, we're a good team" or "This team is going places #dcRising" after a winning streak. This team actually had championship aspirations. We were a healthy John Wall wrist away from the Eastern Conference Finals a couple years ago. Since then we have gone backwards (again). A better GM would have seen the cap increase, bring in better players, and take a chance at KD. A better GM would have seen #KD2DC not working and had a better backup plan. Leonsis is wasting the prime years of one of the greatest Wizards/Bullets players of all time because he can't let go of his friendship with Ernie Grunfeld. If all this, all 13 years of mistakes isn't about friendship because that is the only thing I can think of, the only thing I can understand, then maybe.... just maybe.... Ted Leonsis is crazy. This is insanity. This entry was posted on Tuesday, December 20, 2016. You can follow any responses to this entry through the RSS 2.0. Responses are currently closed.